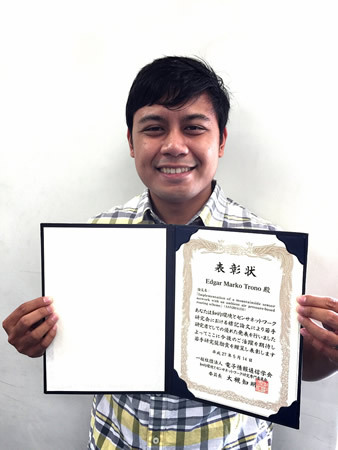 Edgar Marko Trono, Ubiquitous Computing Systems lab., was awarded in the Technical Committee on Ambient intelligence and Sensor Networks (ASN). Because this study is still in its early stages, I was unsure about its potential. This award shows that there is interest in the academe, and it encouraged me to continue. I would like to thank all my professors for their guidance, ATR for making this study possible, and Kume-san for working with me. There are more to learn, problems to solve, and hurdles to overcome in this research. I will do my best and work harder to produce an output that can help gather mountainside data.